The CIMSA JANUS-400 Multi-Mission Tactical System allows various configurations of the state-of-the-art Plus Tactical Ram-Air Canopies (9 & 11-Cell) with the JANUS-400 Harness/Container System according to the specific task of each user. SAR (Search & Rescue) and CSAR (Combat Search & Rescue) insertion for support, cover, first aids and recovery of distress personnel in high risk situations. 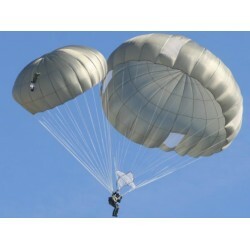 Military Tactical Tandem Free Fall Operations. The JANUS-400 Multi-Mission Tactical System allows the following tandem or solo jump mission configurations with both oxygen systems and cargo equipment. *Maximum suspended weight (pilot + parachute + passenger + passenger harness + cargo) never must be over than reserve canopy maximum operating weight. **Depending on reserve canopy choose. Cells: canopies with 9 or 11-Cell depending on required glide ratio. Type of fabric: low porosity canopies (03CFM) and Hybrid canopies (0CFM on top and 03CFM on ribs and bottom surface) in order to maintain more time all its flight performances without hindering its packing process. Configuration: By Pass (BP): oriented to high altitude drops up to 260kg with drogue. 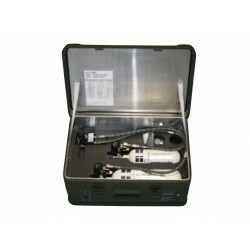 The combination between JANUS-400 harness/container and the different types of Plus tactical canopies give us the following standard JANUS-400complete multi-mission tactical systems.